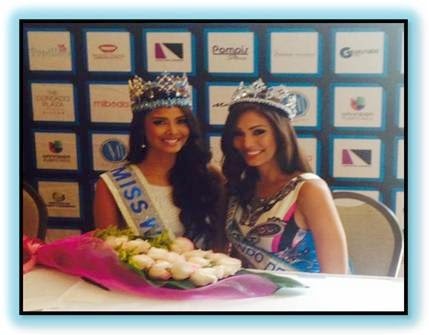 With the song "Querube" interpreted by Eddie Ricardo, Megan Young, Miss World 2013 was visiting Puerto Rico and met with the local press at the Los Almendros Hall of the Condado Plaza Hilton in San Juan. Young welcomed the participants and said in Spanish "I am very happy to be on the island and feel the warmth of its people. We would have loved to be more days in Puerto Rico, but the schedule of activities changed after my appendicitis operation three weeks ago. But I'm glad to see my friend and sister Nadyalee and see the community work of the organization and to share with the girls"